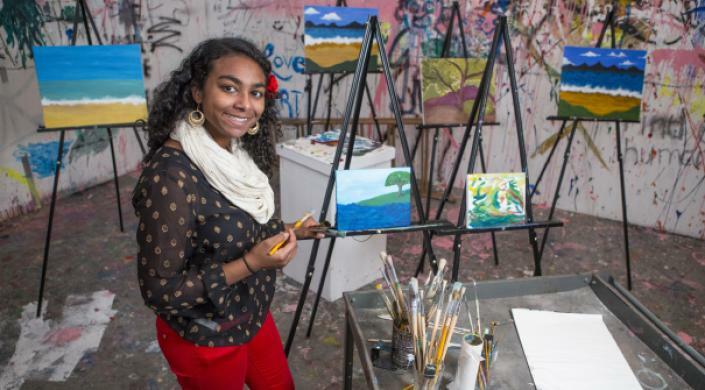 When she's not in class, studying, or working on an engineering project, Eboni White can often be found painting in the Adams House art studio. 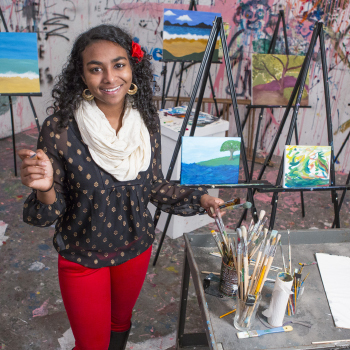 As mechanical engineering concentrator Eboni White buckles down for her junior year at the Harvard John A. Paulson School of Engineering and Applied Sciences (SEAS), she discusses challenging courses, robotic screwdrivers, and songs of the African diaspora. I’ve always loved tinkering with things, so engineering appealed to me from the start. When I was in high school, my brother was diagnosed with epilepsy. I spent hours researching epilepsy on the Internet to learn all I could. I read about a team at Johns Hopkins that is engineering a brain chip that could prevent seizures, and that really piqued my interest in biomedical engineering. I had a very tough time choosing between biomedical engineering, electrical engineering, and mechanical engineering, but I ultimately chose mechanical because I feel that it’s the most hands-on. What has been most surprising to you during your first two years at Harvard? For me, it was surprising to realize that some of my hardest classes—the classes that definitely don’t give me the grade that I want—are actually the ones that I look forward to and enjoy the most. That has been a huge learning experience for me. I love what I’m doing now, but it challenges me every single day. You spent this past summer as an intern at JR Automation in Holland, Michigan. What was unique about that experience? I did a lot of work around controls engineering during that internship, dealing with sensory inputs and robotics. Our job was to engineer automatic screwdrivers to insert screws with a certain amount of force. It was crazy to see how much work goes into each step of the process. Making one car door takes six or seven machines. When the plant is running at high speeds, and the machines are producing about 200 doors in a minute, it is really incredible to watch. The previous summer, you interned in a biomedical laboratory. Having had hands-on experiences in two very different engineering fields, is there one you think you’d like to focus on for a career? I love the research and development side of things, but I also never lost my interest in biomedical engineering. I think having a career in the biomedical engineering field would be a great way to help people. I’d definitely be interested in working on robotic limbs and the mechanics of how those limbs connect to the person. I’d like to develop robotic limbs that look even more lifelike and find ways to monitor the weight of the limbs so they are properly tailored to each person. As a female engineer, what do you think it would take to inspire more women to pursue engineering careers? Having role models to follow is a huge form of encouragement for women engineers. Right now, I have two female engineering professors and they both give me a lot more confidence. It is critical to have support networks, other women in engineering that I can call or text when I get confused, stressed, or run into a problem. For me, it has always been very impressive and inspirational to see how many women come to the SEAS Concentration Fair at the beginning of the year. Just knowing that there are other women out there who are going through the same struggles that I am makes a huge difference. Singing with the Kuumba Singers is one of my favorite things to do when I get frazzled. The Kuumba Singers, which started in 1970, is the oldest existing black student group on campus. We sing songs of the African diaspora—everything from traditional songs in the Zulu language to pop works by Michael Jackson. I love the group because they are a community of people who really care about me and support me. Since being at Harvard, I’ve seen how people can get so caught up in boosting their GPAs and resumes that they forget to invest in themselves for the moment. Kuumba lets me give myself a break and escape the Harvard challenge atmosphere for a few minutes. Now that your junior year is in full swing, why do you think the School of Engineering and Applied Sciences has been a good fit for you? I’ve learned a lot of things about myself—like how to know when I need help, and how to swallow my pride and ask for it, or be receptive when it is freely given. SEAS has also taught me a lot about collaboration, and how to work with a person who has a completely different personality than me. Teamwork is huge.